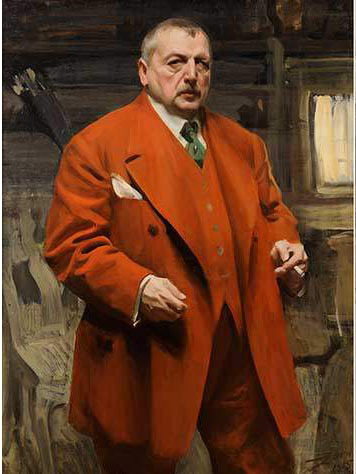 I wanted to write a glowing review of the Anders Zorn show at the Palace of the Legion of Honor in San Francisco now through February 2, 2014. Anders Zorn is considered by many painters to be one of the Big Three of early 20th Century painting (the other two are John Singer Sargent and Joaquin Sorolla). He is not as well known by the public now, but in his day he was quite successful as a portrait painter and painted the portraits of three U. S. presidents. Anders Zorn, Self-Portrait in Red, 1915. Oil on canvas. Zornmuseet, Mora. Photograph by Patric Evinger. Zorn is also known for his limited palette, on display in the self-portrait that opens the exhibit: white, yellow ochre, vermilion, and ivory black. The self-portrait also has a dark ochre that might be burnt umber or some other darker earth color. In that palette, the blacks can look blue when placed next to warmer colors. And for the landscapes, Zorn may have also used viridian, but I don’t think so. The green in his landscapes is so odd, I think it, too, must be made with black, though I’m not sure how. Which brings me to why I cannot whole-heartedly recommend this show to someone who just loves art, and has no interest in the craft or in art history. For ultimately, though most of the paintings are supremely well executed, I cannot love them. The paintings are just cold*, by which I mean the temperature of the colors, not the emotion he seeks to portray. The paintings are also, for the most part, somehow calculating. Even the nudes, for all their daring (naked women in the landscape!) are a little voyeuristic and prurient. I think I was reacting to that famous palette. Without blue, the colors somehow seem cold and off. And yellow ochre is a harsh, dull yellow under the best of circumstances. If anything, I was reminded of early Van Gogh, before he went to Paris: all dark and umber and black. A few of the nudes are warmer, as Zorn got the warmth of the day into them. This is just my own opinion, mind, and you are free to disagree with me. But I’m gonna stick with a fuller palette. Have you seen the Zorn exhibition? What did you think? *See especially “Man and Boy in Algiers,” a watercolor from 1887. The rendering is perfect. But the skin tones in sunlight are cold. There is almost no warmth at all in that sunny day painting. My goodness, but I’ve been away from this blog a long time! 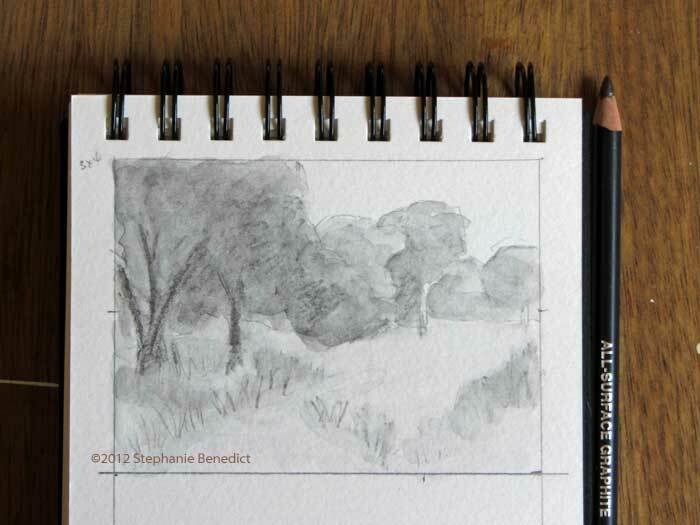 Sketch for Vernal Pools. ©2012 Stephanie Benedict. 3″ x 4″ graphite. I do love water-soluble graphite! I learned a powerful lesson about the need for systems this year. Having good systems will support you in your whatever you do, from having an organized computer and file system, to building supportive habits of writing, drawing, or whatever it is you do. I fell away from writing at first because my computer decided to stop working, and had to be replaced. That meant recreating my old hard drive, re-installing software. (But of course nothing works quite the same. I would like to request that you software developers out there not fix things that aren’t broken.) And then I just got busy and never got back to posting. So—I’m rebooting this blog. I intend to post approximately weekly, and to write about nature, painting, and painting (and drawing) nature. I hope you find something interesting here, and perhaps even learn something! 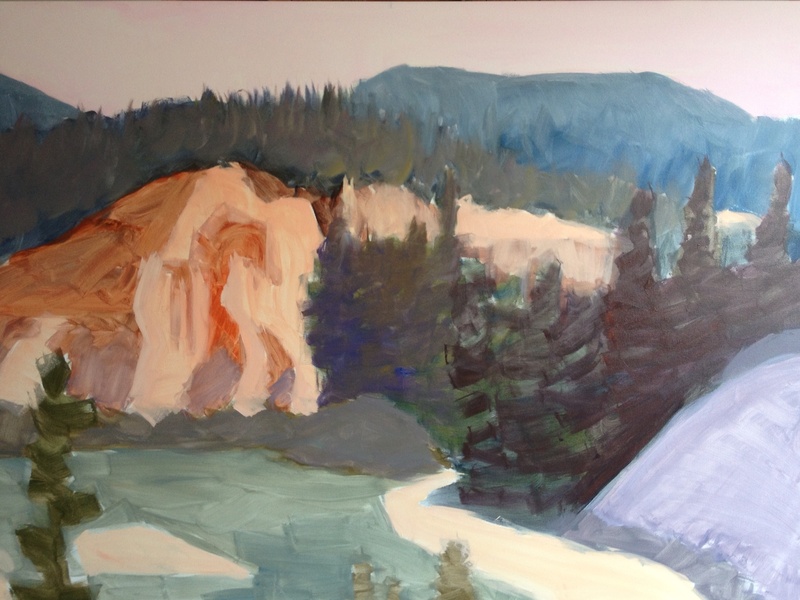 I finally got myself to Malakoff Diggins State Historic Park to paint last week. It’s been something I’ve wanted to do for some time, and we got a relatively cool-ish day so I packed the car and drove the two-plus hours from my house. (Far nice than this weekend, which is another scorcher*.) As I drove up into the foothills on ever narrower roads, I kept thinking about the truth behind Sacramento’s big claim to fame: it really is just two hours from anywhere. The weekend before, I’d driven two hours to San Francisco. A view of the “diggin’s” at Malakoff Diggins SHP. The trees in the valley have grown since mining ended in about 1884. 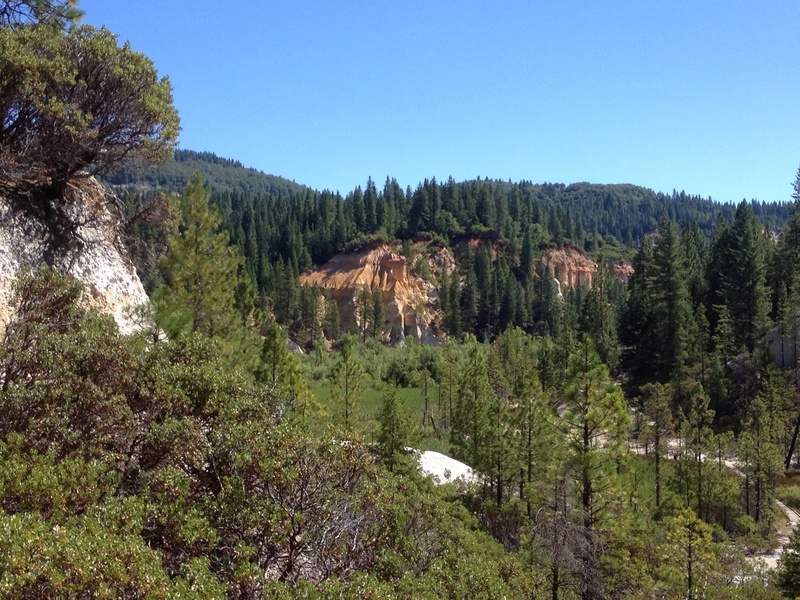 Malakoff Diggins is the site of the largest hydraulic mine of the California gold rush. Huge water cannons were used to literally wash away the soil overburden and expose the gold beneath. It’s a terribly destructive process that washes away mountains, leaving badlands behind. Today, Malakoff Diggins is recovering, sort of. The mining generally ended in California in 1884, after a legal battle with farmers downstream, where the sediment washed down from the mines changed the rivers and caused flooding**. In the intervening years trees have grown where there is soil. The valley floor is covered with marsh, even in this dry year. The mountains of course will never regrow; there will always be scars from what the humans did here. But those scars are both fascinating and beautiful. 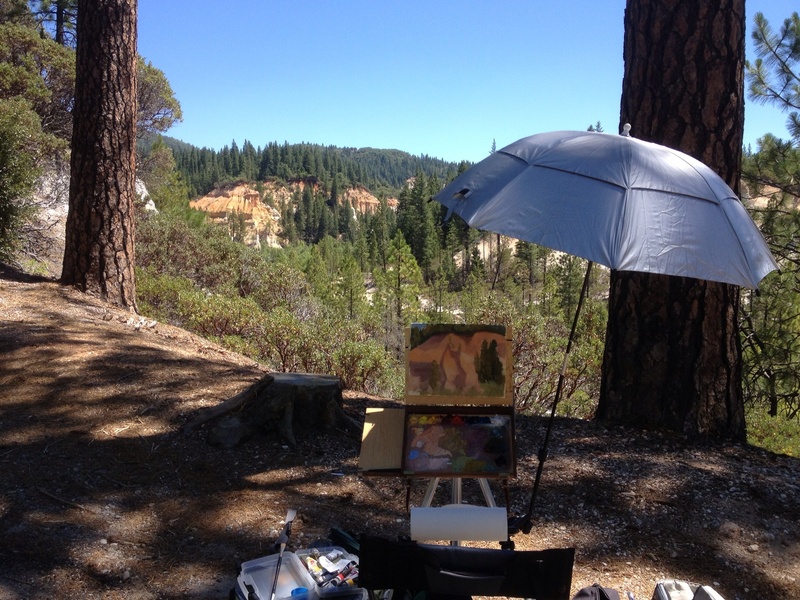 I’ve long wanted to paint the scene, so I set up my easel in the shade of a Ponderosa pine. The air smelled of pine and manzanita. 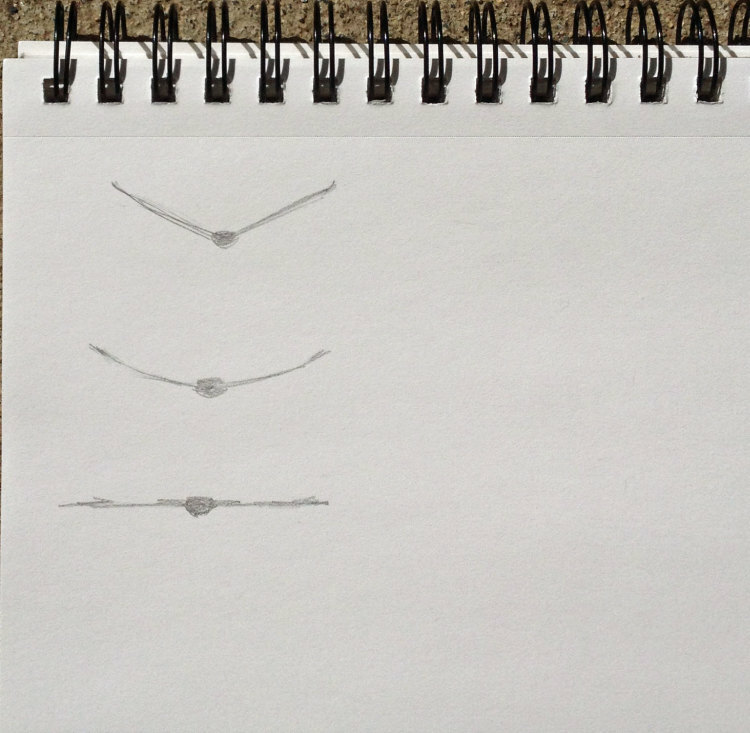 I sketched for a couple of hours. I didn’t intend to do a complete painting; I just wanted to record the colors for reference. My set-up at Malakoff Diggins. I found a great spot right next to my car. How convenient is that? Now, I’m back in the studio working on the painting. It will be 30 x 40. Here’s a shot of the underpainting, done with acrylic paint mixed with gesso. This is actually my favorite part, probably because I really can’t mess it up yet. The only down side to this is that I have to wait overnight to start the oils, because I need to let that gesso dry thoroughly, and I’m eager to work on this one. I’ll keep you posted on the progress. The underpainting. 30″ x 40″. ©2013 Stephanie Benedict. The colors are darker than they ultimately will be, because I was focusing on the shadows within the trees here. What hidden gem of a park is close to where you live? *I talked to a friend who is actually is a weather forecaster in the Navy reserve. He thinks that the next few decades will be notable for NOT having a “normal” weather, but rather by increasingly chaotic weather patterns. He may be right–the system cannot stabilize while we keep pumping energy into it. I think that we all need to get used to this extra heat. **But it’s still practiced in other places around the world. In a recent post, I posed the questions of why I don’t put birds into my paintings. Today, I answer that question. I was a bird watcher long before I took up painting. I take my binoculars and camera with me when I paint outdoors, though birds can be a big distraction. So why not include them in the paintings? In a word: verisimilitude. I’m not a wildlife painter. 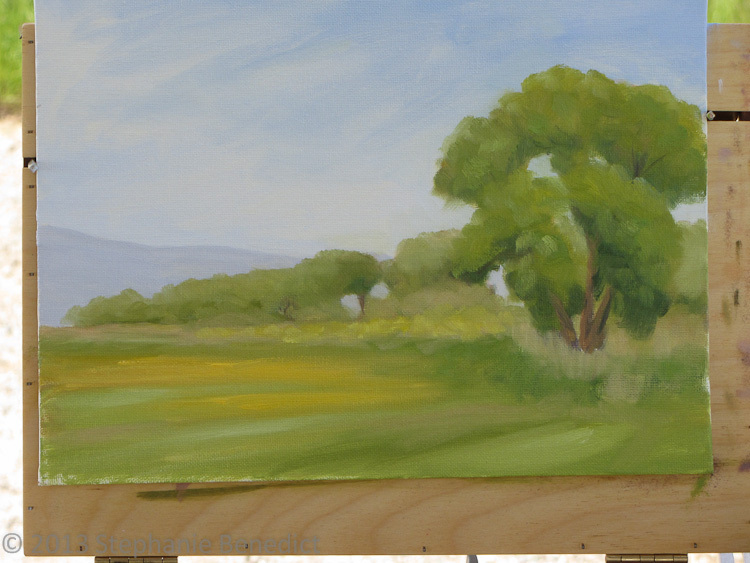 If I’m going to put birds into my landscape paintings, I want them to look like they belong there. I don’t mean the perspective of getting the foreshortening of the wings correct, though that’s important too. No, I mean getting the bird the right size in the scene. A friend suggested just putting in a dash for a flying bird. Well, ok, but I want the dash to be correct. Too big and the bird is too close. Too small and it’s just a dot. I want you, the viewer, to be able to tell turkey vulture from red-tailed hawk from great blue heron. Birds can tell a person a lot about the landscape, the ecosystem, the season. Birds move all the time. The presence if an osprey says something different about the territory than does the presence of a golden eagle. I want to be able to be accurate in my representations. But all of that is just an excuse. So I guess my answer is: I’m workin’ in it.